Happy Monday! I hope you had a fantastic weekend. Because our heat indices were in the 110’s this weekend, I played it safe and stayed inside (read: “was lazy”). I topped off my lazy Sunday by making a batch of these Apple Pie Scones. Coffee + fresh scones + movie = best Sunday afternoon ever! I love scones because they’re only ever so slightly sweet, go great with coffee, and they freeze really well. So, I can whip up a batch, then toss them in the freezer after they cool. 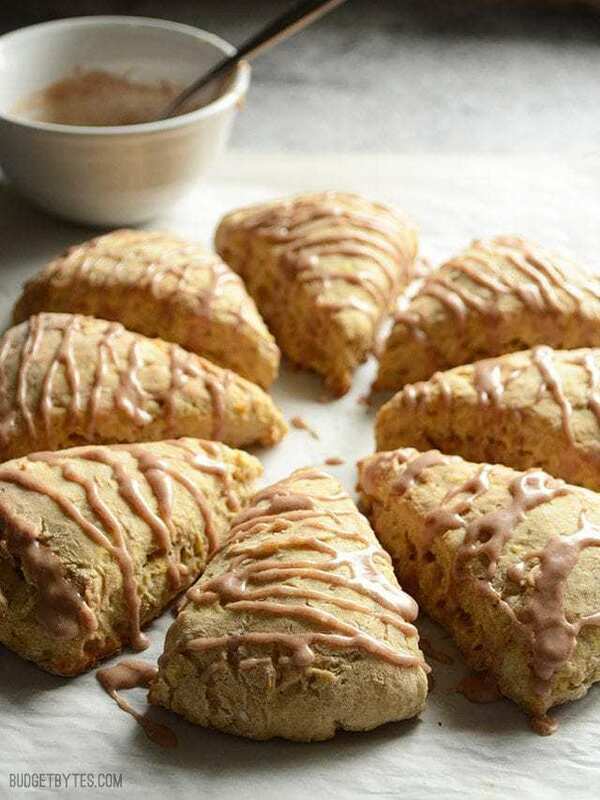 That way I can pull out just one of Apple Pie Scones at a time on mornings when I want something a little extra special, or grab a couple if unexpected guests stop by. They thaw fairly quickly at room temperature, but you can also pop them in the microwave for 15-30 seconds for a nice warm treat. 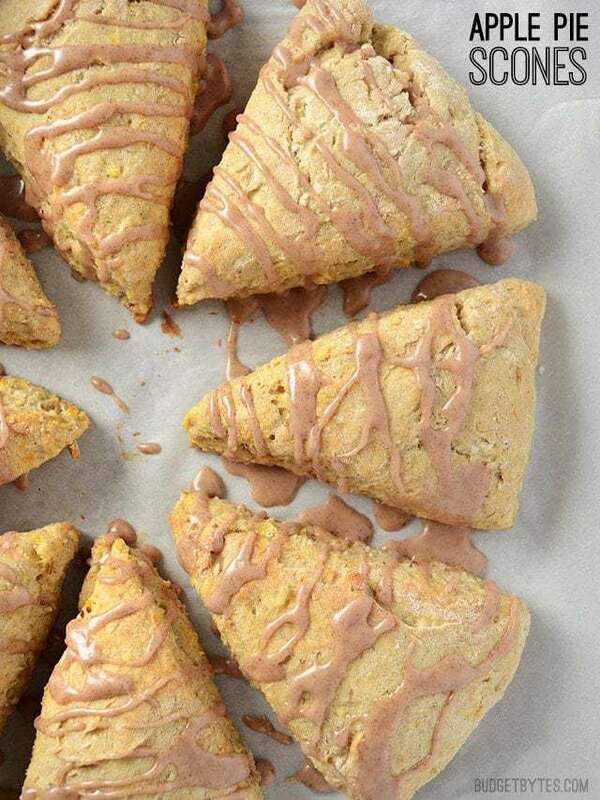 The shredded apple and unsweetened apple sauce make these scones a little more moist than most scones and allowed me to cut down a little on the added sugar. If you happen to live in an area where you can get real maple syrup for a decent price, you can substitute maple syrup for the sugar for even more flavor. 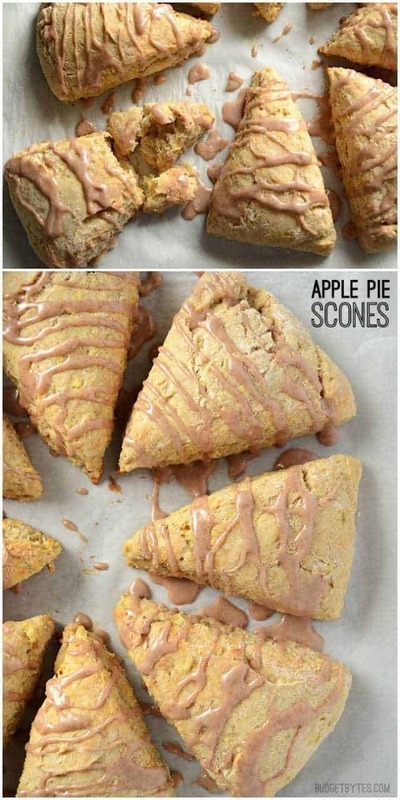 Cinnamon, ginger, and bits of shredded fresh apple make these Apple Pie Scones the perfect treat to go along with coffee or tea. Preheat the oven to 400 degrees. Wash the apple, cut it into quarters, then cut off the core from each piece. Use a box grater or large holed cheese grater to shred the apple. In a medium bowl, whisk together the egg, apple sauce, lemon juice, sugar, and shredded apple. 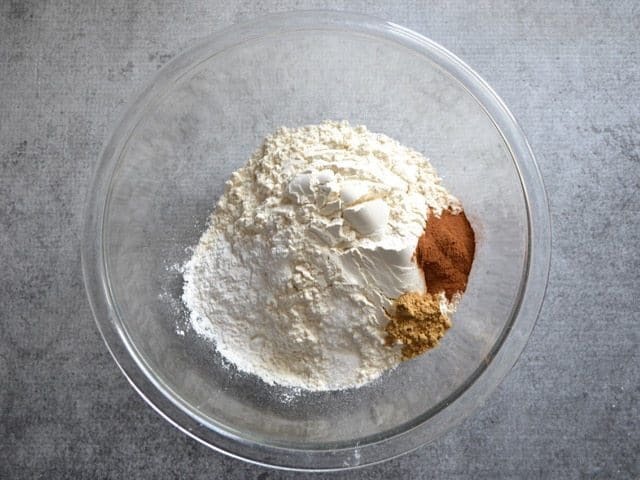 In a separate large bowl, stir together the flour, salt, baking powder, cinnamon, and ginger. Once combined, add the butter and work it into the flour until it resembles coarse, damp sand. Finally, pour the bowl containing the apple egg mixture into the large bowl with the flour and butter. Stir just until a dough forms and no more dry flour remains on the bottom of the bowl. 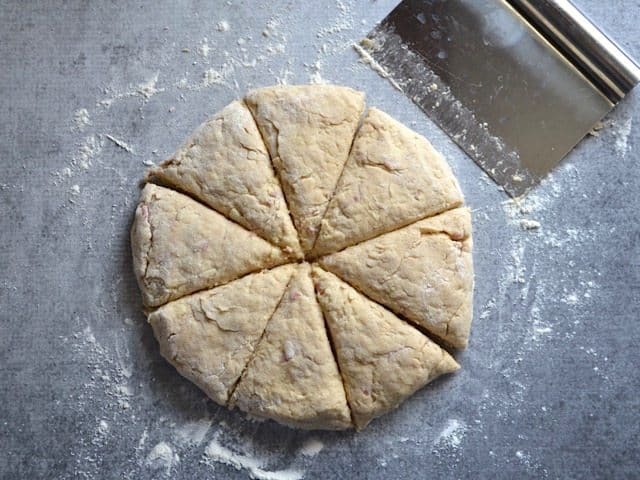 Turn the dough out onto a lightly floured surface and shape into a 6-8 inch wide, 1.5 inch thick disc (sprinkle more flour on your hands and on the surface of the dough if needed. The dough may be slightly sticky). Cut the disc into eight wedges. 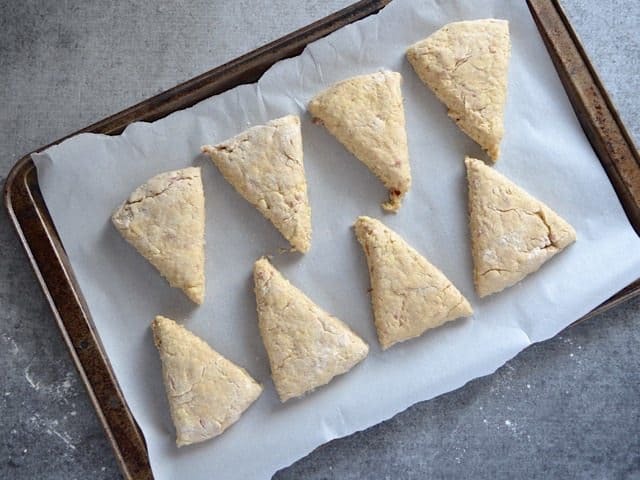 Line a baking sheet with parchment paper and place the cut scones on top. Bake the scones for 18-20 minutes in the fully preheated oven, or until they are just slightly golden brown on top. Allow the scones to cool completely. To make the glaze, stir together the powdered sugar, cinnamon, and water until a thick paste forms. Once the scones are fully cooled, drizzle the glaze over top. 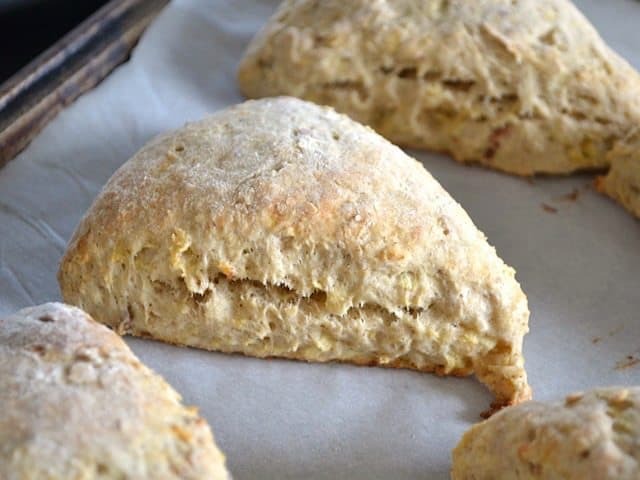 *Because these scones do not contain a lot of sugar, use a sweet variety of apple, like Braeburn. Avoid overly tart varieties, like Granny Smith. Preheat the oven to 400 degrees. Wash a medium apple well, then cut into quarters. Cut the core out from the center of each quarter. 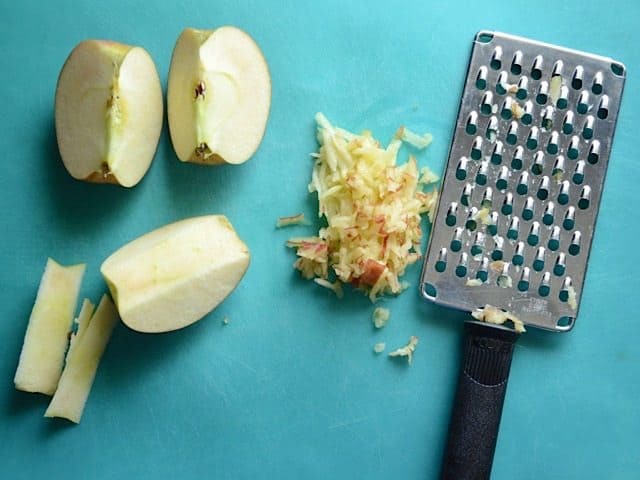 Use a box grater or a large holed cheese grater to shred the apple (this yielded about 1.25 cups of shredded apple). Whisk together one large egg, 1/4 cup apple sauce, 1 tsp lemon juice, 1 Tbsp sugar, and the shredded apple until combined. 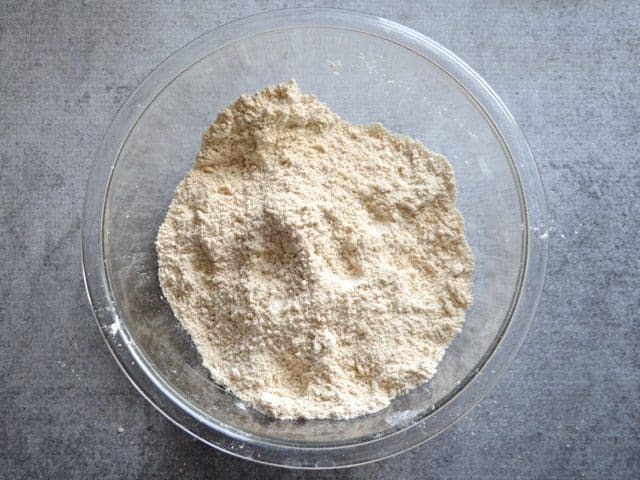 In a separate large bowl, stir together 2 cups of all-purpose flour, 1/2 tsp salt, 2 tsp baking powder, 1 tsp cinnamon, and 1/2 tsp ground ginger. Add 5 Tbsp COLD butter to the flour mixture and work it in until it resembles coarse, damp sand. I just use my hands to kind of smush and grind the butter into the flour, but you can use a pastry cutter or even freeze the butter and then shred it using a cheese grater straight into the flour. The goal is to get little tiny pieces of solid butter mixed into the flour. Those little pieces are what help achieve a flakey texture in the final scone. Pour the bowl with the apple-egg mixture into the bowl of dry ingredients. 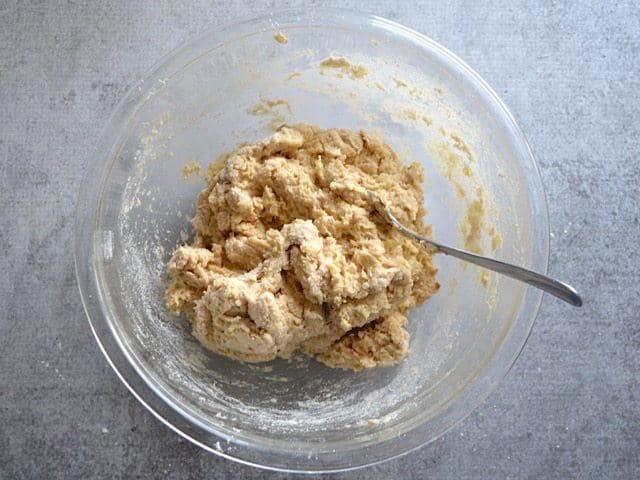 Stir it just until a dough forms and no dry flour remains on the bottom of the bowl. The dough may still be slightly wet or sticky, but that’s okay. Turn the dough out onto a lightly floured surface and gently shape it into a 6-8 inch wide disc (about 1-1.5 inches thick). Dust the surface with a small amount of flour, if needed, to keep your hands from sticking. Cut the dough into eight wedges. 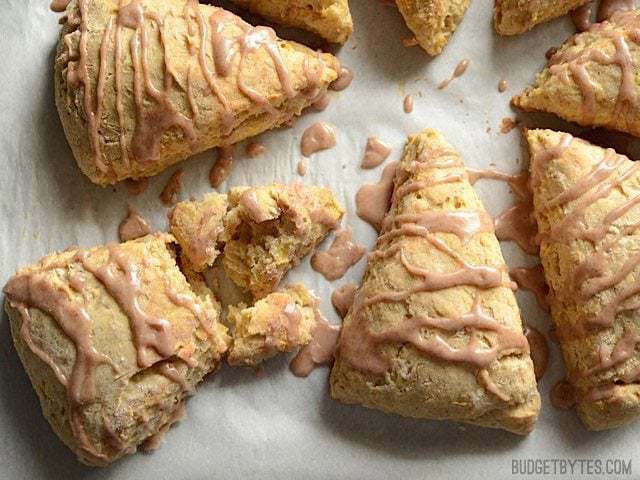 Place the scones on a baking sheet covered with parchment paper. Bake the apple pie scones in a fully preheated 400 degree oven for 18-20 minutes, or until they are light golden brown. Allow the scones to cool completely. Once the apple pie scones have cooled, prepare the glaze. In a small bowl stir together 1/2 cup powdered sugar, 1/2 tsp cinnamon, and 2 tsp water. 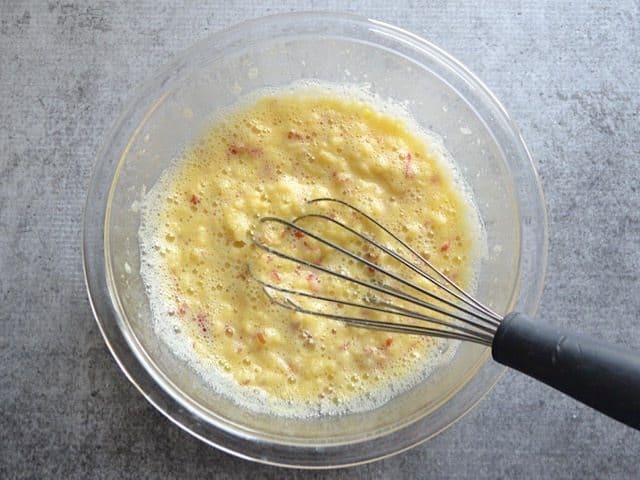 Stir until a thick, almost paste-like mixture forms. Drizzle the glaze over the scones. Could you grate 1 1/2 apples rather than open a can of Apple sauce? Has anyone tried this? These are delicious and soft! I didn’t glaze, so I probably should have added more sugar, but I’m still enjoying them a lot :). These were sooo yummy, Beth! 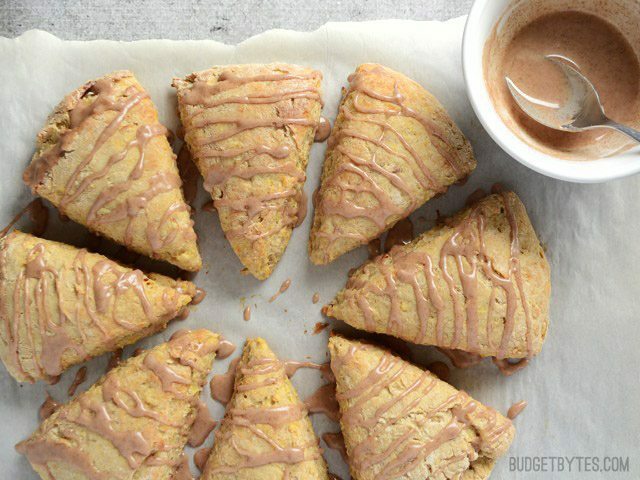 These scones sound amazing! I love how detailed your recipes are, but could you also add the calorie count to all of your recipes? I love all your scone recipes! I’m getting ready to have my second daughter in October, and have been squirreling away frozen meals for the past week or so. I’d love to add these treats to my freezer, but wondered: should I glaze them before or after freezing? I think I’d glaze after. The condensation that can form as they thaw might melt the glaze. I love the idea of a crusty cinnamon topping, too! I love the idea of a crusty cinnamon sugar topping as well. Did you end up doing it? I would love to try that as well. Any suggestion on how to make one?